In the New York metropolitan area, the residential real estate market is often seasonal. During the holidays between Thanksgiving and New Years Day, most sellers do not list their properties for sale or may remove their home from active listing status. During the winter months, most buyers are reluctant to be exposed to the cold weather and the snow to view properties. Fortunately, all of this changes with the approach of spring. The inventory of homes increases as more properties are listed and additional purchasers are looking to enter transactions. Both parties to transactions, who will experience increased competition as inventory increases, should take the steps described in this post so as not to miss the spring season. The school calendar is also strongly influential on real estate transactions in the New York suburbs. The optimal time to close for both parties is between the end of June and the beginning of September, so that the children of the selling family can complete their current school year and the children of the purchasing family can start the next school year in a timely fashion. When representing purchasers, our attorneys confirm that the property is in the school district expected by the purchasers. If the closing may occur close to, but not in advance of the start of school, we will contact the school district to determine whether the children of the purchasing family can start school prior to the closing. We will provide any documentation requested by the school district to assist in enrollment. Our lawyers will creatively fashion a solution so that the closing can occur as needed to enroll the children in school. The following steps should be undertaken by sellers considering bringing their property to market. The home should be physically ready, so that is shows more favorably, bringing the best price to the seller. For instance, decluttering should be done to make the rooms and closets seem larger and to make it easier to move when the time comes. Since painters get busy in the spring, appointments should be made to freshen up the look of the home. Did the winter cause any property damage such as leaks, broken gutters and the like? If so, repairs should be made before bringing the property to market. The seller should confirm that all improvements have been made in compliance with the building regulations of their municipality. If not, these issues should be addressed promptly. Likewise, if the seller is an estate, the documents should be filed with the Surrogate’s Court by an estate attorney , so that the documents authorizing the fiduciary to act at the closing will be ready once needed. The seller should prepare to locate her next home. If there is a waiting list to enter a desired assisted living facility, the seller should enroll on the list as soon as possible. The seller should interview prospective real estate agents and contact the attorney who will promptly prepare a contract of sale once the offer is accepted by the seller. Buyers should take these steps to be ready when they find their dream home. Sellers will want evidence that the buyer is financially prepared to enter the transaction. If paying cash, the buyer should be prepared to present an account statement showing liquid assets substantial enough to proceed. If assets need to be sold to meet this goal, the process should start. If the buyer is getting a loan, he should make inquiries with potential lenders for loan terms and whether the lender will be involved in the transaction contemplated (some lenders do not make cooperative apartment loans). It is very helpful if the buyer obtains a pre-approval letter from their projected lender. A pre-approval letter is the lender’s written confirmation that it will make a loan to the buyer of the stated amount at the stated estimated interest rate. Since the pre-approval letter is produced after the lender reviews the buyer’s credit, it is a useful tool to demonstrate to the seller that the buyer is loan worthy and will be able to conclude the transaction. Also, the pre-approval letter assists the buyer in knowing how much he can comfortably afford when making offers on properties. However, the pre-approval letter should not be confused with a formal loan commitment, in which the lender is confirming that it will lend to this buyer to purchase this particular property, which has appraised to a value of at least the contract price. Buyers should have their tax returns filed as soon as possible, in case they are needed to support the loan application. In addition, buyers should have their professionals selected. Consistently working with the same real estate agent is useful because she will become aware of the tastes of the buyer and will be more successful in locating the ideal home. The buyer should select his attorney , so that contract negotiations can commence immediately. The buyer should also consider the steps needed to vacate his prior home. If the buyer has been renting, our attorneys should negotiate with your landlord in order to coordinate the vacate date corresponding to the closing. Of course, it is not unusual for our attorneys to coordinate the sale and purchase transaction so that they take place in a fashion best suited to the parties, even if they have to take place on the same day. 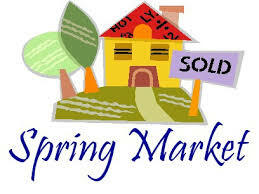 The increased inventory in the spring real estate market is beneficial to buyers and sellers. Both parties should be prepared in advance to take advantage of the season. Our attorneys would be pleased to assist you and welcome you to your new home this spring.